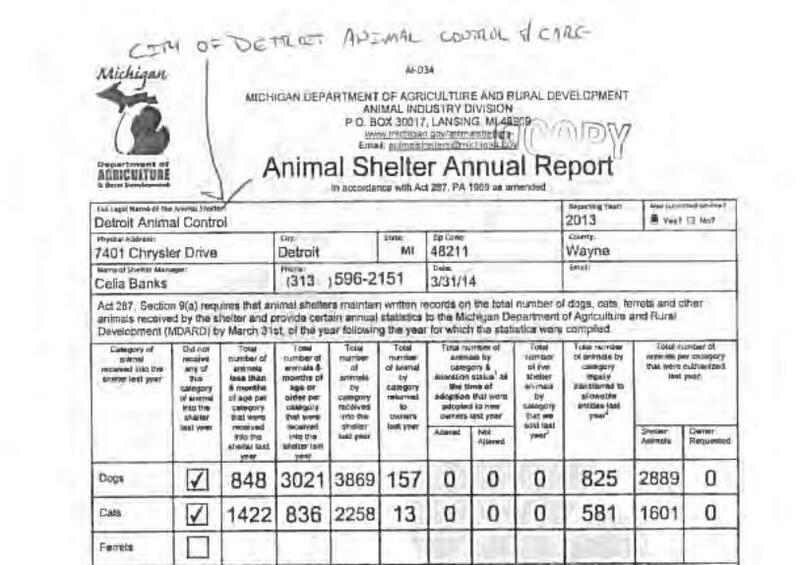 Screengrab from the Michigan Department of Agriculture’s website showing the Detroit pound’s 2013 report. 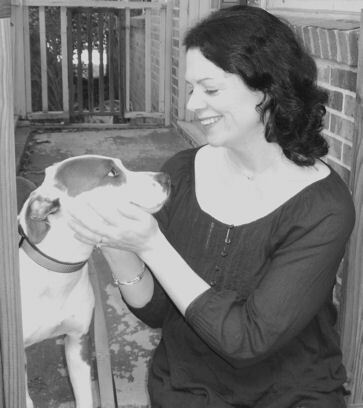 The issue of who owns a stray dog in Detroit is being challenged for the Detroit Dog Rescue. […] DDR was told by Detroit Animal Control that they are no longer allowed to take dogs from police officers. Detroit police said that under state law, shelters are required to have documentation as to who dropped the dog off. Dogs must remain with animal control for four business days to allow the owner time to claim the dog. If the dog is not claimed, authorities will decide if the dog is adoptable. 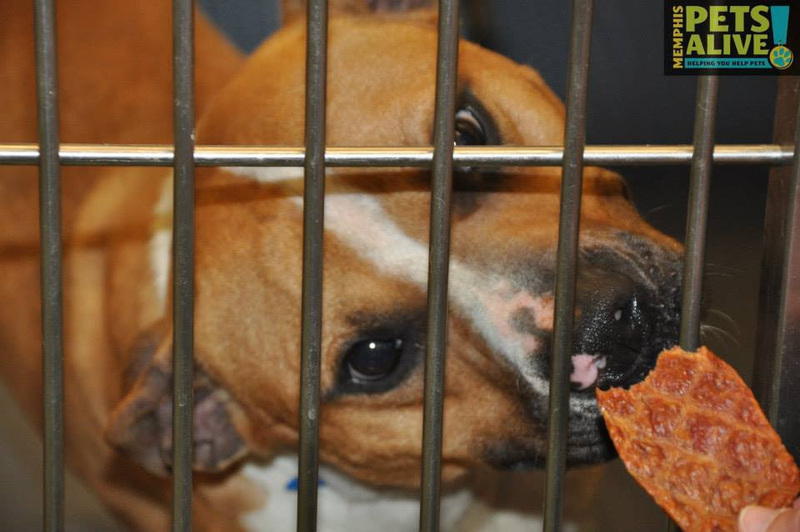 But most likely, the dog will be killed – the usual outcome for pets at DAC. I guess they forgot to mention that part. 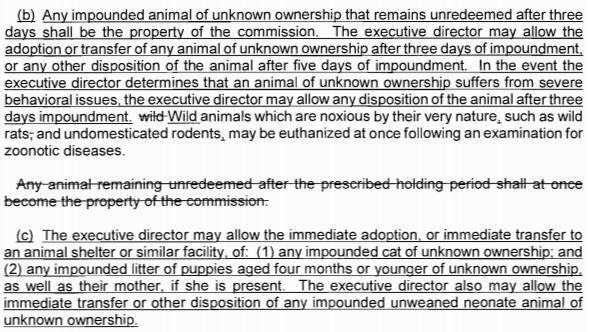 To be clear, I am absolutely in favor of any group that takes in strays following the applicable laws for holding periods and reporting so that owners can reclaim lost pets. 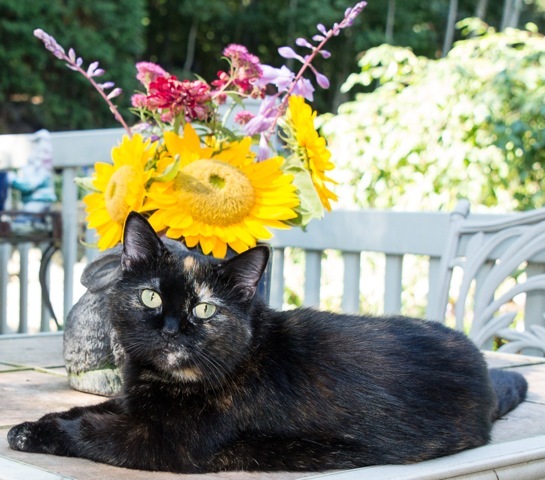 Many shelters have systems in place to allow finders of strays to keep them for the mandatory holding period while listing them on the shelter’s roster of found pets. Michigan law appears to allow for private groups to take in strays as long as they properly report the animals to police. 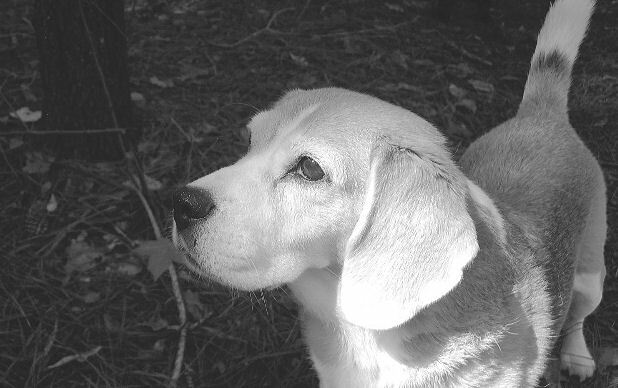 If DAC is truly concerned about private animal groups following the state holding period law for strays perhaps they should start by looking at their own partner in crime, Michigan Humane, instead of chasing groups trying to actually shelter strays – the job DAC is supposed to be doing. 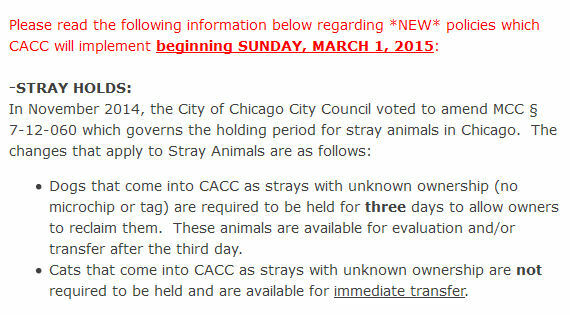 There is surely no cause for DAC to be taking animals away from rescue groups committed to saving them. On September 16, 2014, the NJ Department of Health wrote a letter to the health officer for the city of Linden ordering her to “immediately” close the pound due to failed inspections in July and August. All the animals and records are to be transferred to another licensed shelter. 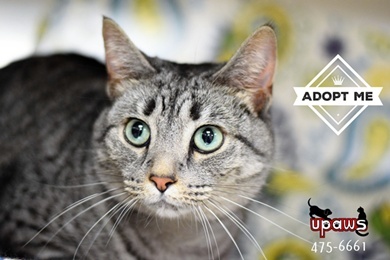 Impounded animals were being sold or killed before their 7 day mandatory holding periods expired. Animals were not being scanned for microchips at time of impound, at time of sale, or before being killed. Ketamine and euthanasia solution showed evidence of being used but no records were kept regarding their usage. Animals were not being weighed before being killed (in order to determine appropriate drug dosages) and no records of animal weights or dosages of drugs used to kill them were maintained. A veterinarian had not established or maintained a disease control or health care program at the pound, as required by law. Housing for the animals was in severe disrepair. It sounds as if the city was given an opportunity to correct problems noted in July but inspectors found conditions worsened when they returned in August. Linden Mayor Richard “A Total Lie and an Exaggeration” Gerbounka says the state health department is “overreacting” and as of today, the Linden pound remains open in defiance of the state order as far as I know. MAS was obligated to hold her for the mandatory holding period which would have expired on June 17. 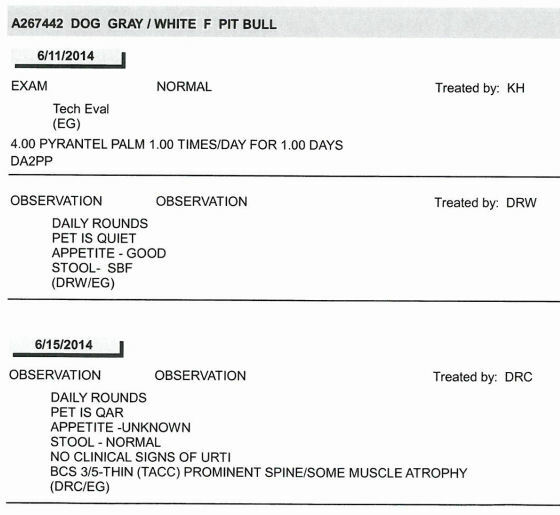 Her medical notes indicate she was a generally healthy young dog. On June 15, an MAS supervisor noted that no one had placed a hold on the dog who had remained hidden from the public since impound. And despite the fact that her owner still had 2 days to claim her, the supervisor noted the dog’s time had expired which appears to be a violation of the stray holding period law. Never having been made available to the public for adoption, rescue or foster, and not even having been held for the mandatory holding period for an owner to reclaim, MAS killed dog #267442 on June 15 (or June 14, if the date noted by the kill tech is accurate). 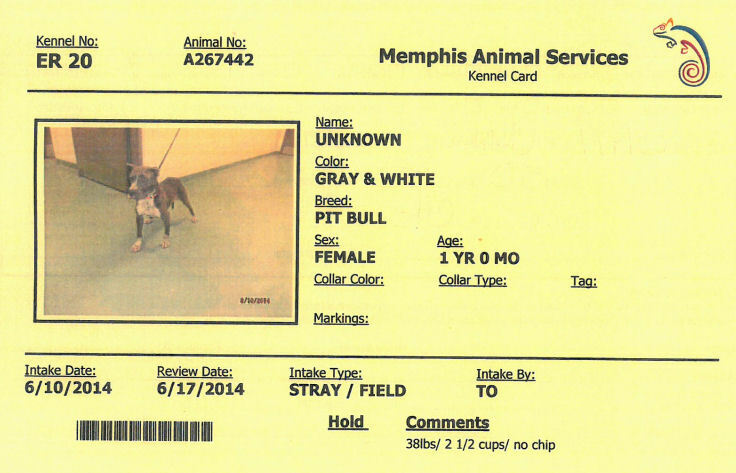 The first day that MAS would legally have been allowed to kill dog #267442 was June 18. I guess they just couldn’t wait. Not that anyone WANTS to kill animals, of course. 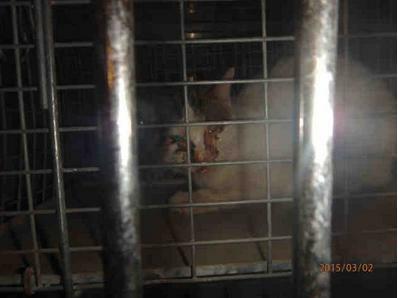 By all accounts the death of one animal in error is unacceptable and MAS is diligently seeking to be error free. How’s that working out for you? Ready to try something different? Is doing your job on the menu?